If you listen in to the DDNet podcast, you would have heard Matt Kelly (@crowdedworlds on Twitter) a couple of times. He's been a bit of a regular on the 'cast, because he's great fun and like Japanese games as much as anyone. 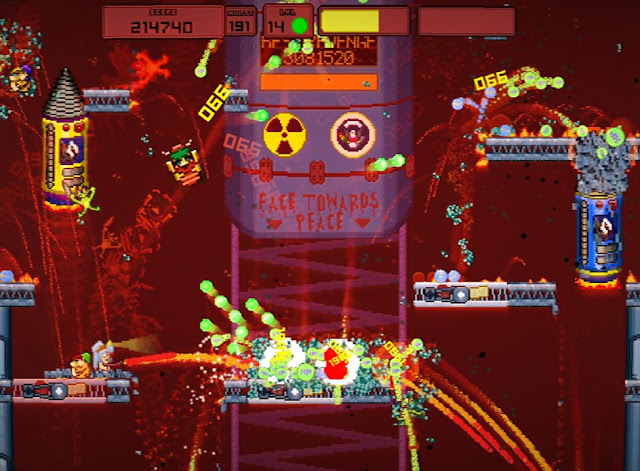 He's also the developer behind Molemen Must Die!, a brilliant little arcade action game that's all about a president that is prone to bouts of puerile tantrums. It was just coincidence that the release of the game happened to match up so perfectly with real world events, but what a perfect coincidence that turned out to be! Related reading: Our review of Molemen Must Die! on PC. Matt K: We're onto our second game at Mokomoto, which is shaping up to be a city builder in the the grand traditions of games like Sim City, except with the additional urban planning complication of regularly being invaded by Kaiju type mega monsters. Players will be asked to balance the day to day needs of the city against the ever present threat of an invasion. It's still early days so it'll be a while before we're sharing super concrete details, but in the meantime, we're also bringing out previous game, Molemen Must Die, to the new indie gaming platform Jump! That's been super fun, they have been the best team you could hope to work with. And lastly we're off to Avcon over in Adelaide this weekend, so if anyone is in town for that, come play some politically charged underground chaos with us! Things are busy! Matt K: It's continuing to grow and morph in interesting ways! I mean, it'd sure be nice IF SOMEONE IN THE FEDERAL GOVERNMENT WANTED TO GIVE US THE SLIGHTEST HINT THAT SOMEONE GAVE A DAMN ABOUT THIS MULTI-MILLION DOLLAR GROWTH AND EXPORT INDUSTRY. Losing Scott Ludlam out of the Senate the past week has been a massive blow on that front, he did a lot of great work supporting the games industry. Outside of politics, we're increasingly finding ourselves in an era where metrics and algorithms are driving games discovery on digital stores, and it's eventually going to get to a point where only 'sure things' get floated to the top. So that worries me. Support from the local games press or local gaming community is only going to become increasingly important. And it's not even about 10/10ing every game that comes out of Australia, or saying it's the bees knees. Alerting people that a game is out can help a player find a niche game that would have never floated to the top of their discovery queue due to metrics. We were really fortunate on Molemen Must Die to have some great coverage (DDNet's review helped a lot!) and community support, but it's really amazing how much cool stuff just flies under the radar. Beyond that though, I think we're right around the corner from another big burst in diversification in the kind of games that are coming out of Australia. We've absolutely smashed it on a lot of fronts, but seeing some of the things that people are working on right now, it's an exciting time! Matt K: Actually recent or developer recent? Keeping pace with the latest games can get pretty tricky as a dev! '911 Operator' really impressed me in a lot of ways, you have to take calls and dispatch emergency services all over town. It's quite stressful, but pretty special. At a feature level, their use of real world mapping is pretty cool. But it takes gameplay that could have been quite clinical and made it very personal. Overall it's an idea that could have gone in a lot of different directions, but the developer made it into something where you're asked to be compassionate about people in trouble, even though you don't know them in any particularly familiar way. That's cool in my books! Matt K: It's a bit of a cliche answer but we really are living in a magical time of accessible game development tools, and having great communities that surround them. I always talk to people who want to dip their toes into game development, and I can't help but say 'What are you waiting for? Go grab Unity, get started, don't even worry about it being good, just make some random thing that interests you. If you wanna keep doing it after that, eventually you will start making awesome games!' There's really just so many roads into game dev right now and the support to help you get started is there, it's really awesome. If I had one peeve at the moment, it'd have to be bundle sites emailing me wanting to sell our games for crazy low amounts like $0.01 cent USD a copy. It boggles my mind why these sorts of businesses get super defensive when we suggest that, hey, that's not really a super great rate for us. There are great bundle sites that do really look after developers (eg Humble Bundle) but further afield, the bundle economy is getting weird. That's not something that can survive long term for anyone. If I ever quit games and go into politics, my platform is probably going to be built on pro-Miku policies. I'm not quite sure what those are yet, but I don't want to get particular fascist about it, so maybe just school programs that teach kids 'yes, your love for that virtual Pop-star is as real as your love of Taylor Swift'. Seriously though, I love Miku, but I'm also really excited for everything else going on in the world of Vocaloids and virtual performers. Even watching Callie and Marie from Splatoon doing live shows blows my mind. It's an exciting time to be alive if you dig innovation in music.